Someone called me earlier, because she had a big virus warning on her screen. This was actually a hoax (a web page trying to install malware), so it's useful to be aware of it, so that you know what to recognise. I've deliberately changed "http" to "hxxp", so that you don't click on it by accident. This is a malicious site, so only go there if you're sure that you can get away safely. I've observed the same behaviour in IE8 and Firefox 3.6.12 (on Windows 7), but I haven't tried any other OS/browser. Note that this says "Message from webpage", i.e. this has come from the internet, not your local computer. (The equivalent Firefox message tells you which website has generated it.) At this point, you should get rid of the message without clicking "OK" or the red X. I tried Alt+F4 (in IE), but that still acted as if I'd clicked OK, so the only certain method is to run Task Manager, select this app, then click "End Task". As a general tip, any program that claims to have scanned your entire hard drive in a couple of seconds is lying! That's the whole purpose of the exercise - the people who set up the hoax want you to run this file, which will then do something nasty to your computer, e.g. joining their botnet. So, you don't want this file! If you get this far, use Task Manager to shut down the web browser completely. In theory, you could download the program, scan it for viruses, then run it if it's safe. However, I used McAfee VirusScan Enterprise 8.7 (with all the latest security updates), and that told me that the file was clean. In fairness, I haven't actually run the program, so I am just assuming that it's bad. However, I trust my instincts more than I trust any anti-virus software. So, if your computer suddenly tells you that you've got loads of viruses, don't panic. If you're not sure what to do, ask for advice. This certainly applies if you're at work: I think I speak for all IT staff when I say that we'd much rather help you out beforehand than clean up the mess afterwards. 2. 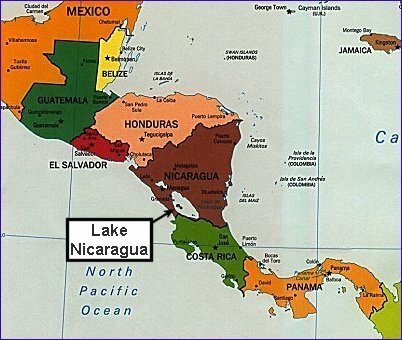 Do an image search for "map of central america" (without the quotes). I think that's it, so I can't fault anyone for being taken in. I don't see the fake virus warning on my PC, but based on the firewall logs and my examination of the page, that's all the other person did. Mind you, it's also odd that the virus warning apparently appeared 10 minutes later, so she thought that it was from a different site. Just to clarify, the "God's Geography" site looks completely safe, and they have nothing to do with the dodgy stuff going on elsewhere; they're just an innocent bystander. DynDNS.com is a legitimate site, which sells sub-domains in "dyndns-blog.com" and "dyndns-server.com" (among others), so agosagyvux and ucyganijo are the equivalent of LiveJournal usernames. I assume that they both belong to the same person, although I'm not sure why he's using DynDNS at all. Maybe the dodgy code is being hopped around to different machines on a botnet? That being the case, it's curious that the bigbestmovie.com page also got updated to refer to a different name, particularly in such a short space of time (less than 2 hours). which just has a list of YouTube videos. This seems like an overtly innocent site, i.e. it's deliberately intended to divert suspicion. I'm not sure what the uid is for; maybe this site is a front for lots of malware sites, and they want to keep track of their customers? I haven't bothered doing a search, but I'm guessing that these domains also belong to the same guy. I've got that far, but now I'm stuck. Should I report this to someone? If so, whom? I don't know whether the bigbestmovie.com site is directly involved in this, or whether they've been hacked. However, even in the best case scenario they look a bit dodgy, i.e. stealing content and throwing in phrases like "miss america" to attract search engines, and for practical purposes they're still dangerous to visitors. Google might be willing to block that site from their search results; the only snag is that I can't duplicate the problem on my machine, so they might not get it either. Again, any suggestions would be welcome. Ah well, if nothing else it's been an interesting exercise. Your initial link is flagged by Firefox as a known malware site and has also now been taken down - the domain isn't findable any more from my machine. The thing I liked most when I went to the bigbestmovie site (which didn't load for me on Firefox OSX - just hung trying to load something) was that a site it was trying to get something from was qooglesearch.com, which is remarkably effective at fooling when you see it in the status bar. I encountered this twice already.